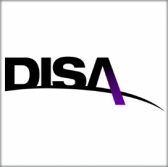 The Defense Information Systems Agency has extended by seven days the deadline for interested vendors to submit feedback on DISA’s plan to build a military satellite communications management system. A FedBizOpps notice posted Thursday says the agency will continue accepting responses to its request for information notice for the potential SATCOM Ordering, Management & Situational Awareness Tool requirement until Sept. 7. DISA wants to know the availability of products, tools and service offerings that can support efforts to manage and standardize satcom mission space operations. A SOMSAT platform would consolidate ordering; fulfillment; resource, configuration, account, security and fault management; and situational awareness functions currently managed through disjoint tools and manual processes. The agency intends for the system to support near real-time ordering and provisioning, global visibility and coordination of all satcom operations and assets, as well as predictive analysis of network capacity and requirements.